There are many different views on what kata is. Kata has been said to be the soul of karate, a repository of forgotten ‘secrets’, a form of moving mediation, a ‘map’ of the combative landscape, a pointless dance, or an archaic relic that should be abandoned. To my way of thinking kata can be all those things and all those views can have merit. Essentially it comes down to what is meant by the word ‘kata’, the background of the individual martial artist and their experience of kata. In this article I’d like to explore what karate kata is to me and why I think the way I do. There are plenty of other examples aside from the above, but what we can plainly see is the view that kumite and kata are linked. What we do not see is the view that kata is the equivalent of sparring. Nor do we see the view on the other extreme that kata has no link to sparring. So if kata does have a link to kumite, what is the nature of that link? To answer that question we need to look at how kata came into existence in the first place. Kata were predominately created to record the fighting methods of a given individual. Let’s look at Kushanku kata (called ‘Kanku-Dai’ in Shotokan karate) as an example. History tells us that there was a Chinese official who went by the title of Kushanku, and that one of his students was a gentleman called Tode Sakugawa. Kushanku is said to have came to Okinawa in the 1750s and whilst there he gave demonstrations of his fighting methods. According to one eye witness – the captain of a ship that ran ashore on Okinawa and was hence interviewed by the authorities – Kushanku was a small man and his methods included placing one hand on the opponent whilst striking with the other hand. We are also told that Kushanku also made use of effective ‘piercing’ leg movements. Tode Sakugawa became a student of Kushanku and it is he who is credited with creating the kata of the same name. Kushanku kata therefore exists to record the fighting system of Kushanku the man. Having created the kata, it was no doubt used by Sakugawa to rehearse and reinforce Kushaku’s teachings when training on his own. The fact that Sakugawa taught the kata to others shows that the kata was also used as a method to communicate these teachings to subsequent generations. It would not be possible to record every single one of Kushaku’s techniques. However, it would be possible to record techniques that illustrate the key principles of Kushaku’s teachings. Through the practise of these techniques, the student could identify these key principles and therefore practise a whole host of methods that expressed those principles; whether or not these specific examples are found within the kata. The idea that kata is predominately a record of principles, as opposed to techniques, is expressed in the writings of a number of the past masters. Gichin Funakoshi’s 18th precept of karate was, "Kata must always be performed exactly; Combat is another matter". In Genwa Nakasone's explanations of that precept - which Funakoshi endorsed - he states, "In actual combat it will not do to be shackled by the rituals of kata. Instead, the practitioner should transcend kata, moving freely according to the opponent's strengths and weakness". Hironori Otsuka (founder of Wado Ryu) wrote “It is obvious that these kata must be trained and practised sufficiently, but one must not be 'stuck' in them. One must withdraw from the kata to produce forms with no limits or else it becomes useless. It is important to alter the form of the trained kata without hesitation to produce countless other forms of training. Essentially, it is a habit - created over long periods of training. Because it is a habit, it comes to life with no hesitation - by the subconscious mind.” (Wado-Ryu Karate page 19-20). Kenwa Mabuni (founder of Shito-Ryu) in 1934 wrote (Karate Kenkyu / How to Correctly Perform Kata), “It is impossible to create two-person drills containing all of the techniques and their variations. However, if one practices kata correctly, it will serve as a foundation for performing any of the large number of variations that may be needed.” (A great full English translation by Mark Tankosich can be found online by googling “Mark Tankosich Kenwa Mabuni Karate Kenkyu”). From the above we can see that kata was viewed as something to be transcended. It was not about specific examples, but the principles exhibited and communicated by those specific examples. To take a line from the martial arts classic Enter the Dragon: “It is like a finger pointing at the moon: don’t concentrate on the finger or you will miss all that heavenly glory”. So it is with kata: If we concentrate too much on the example, we miss the principle that the example is supposed to communicate. We have now seen that the old masters said that kata and kumite are related. We have also seen that kata were created to record techniques that encompass the key principles of a given fighting system. I’d now like to return to the nature of the link between kata and kumite. I think a good analogy between kata and kumite is that of recipes and cooking. A recipe is a set of instructions that allows the chef to cook good food. Kata is a set of instructions that allow the practitioner to explore a given set of combative concepts. Owning a recipe book does not make one a chef. In the same way knowing kata does not make you a martial artist. A chef needs to cook and the martial artist needs to fight. Saying that kata is a substitute to kumite is a bit like saying we should eat recipe books. The chef takes the recipes into the kitchen and cooks inline with those recipes. Likewise, the martial artist needs to take the principles of kata into sparring. Kata is a record of the principles to be given free reign in sparring. A physical solo template, consisting of combative motions, created to record the key principles of a given fighting system so that those principles can be passed on to subsequent generations. Based on the writings of the past masters, what I know of karate’s history, and my own reasoning, this is what karate kata is to me. As discussed previously, it can be other things too. 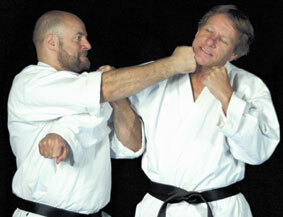 However, first and foremost kata is a record of combative principles. To effectively make use of those combative principles we need to move beyond the solo form to practise the techniques with a partner (in a realistic fashion) so that we can internalise the underlying concepts and then freely express those concepts in sparring and in combat. I’ll cover this process in more detail in coming articles. We will also explore the “secondary” aspects of kata too in the hope of covering all the positives and pitfalls of kata. However, for now I hope you’ve enjoyed this exploration of what karate kata is and, regardless of weather you agree with me or not, I also hope this article has provided food for thought.